Boil the potatoes until soft, drain and leave to cool. Heat the oil in a sauté pan and fry the mince, ginger and garlic for about six minutes until cooked. Season with soy sauce and add sesame seeds, spring onions and chilli flakes and gently mix in the cooled cubed potatoes. Moisten the rice paper a sheet at a time in cold water and fold around a tablespoon of the mixture, sealing at the top by pinching it together. Repeat until you’ve used all the mixture. Set aside while you make the kimchi. Shred the cabbage and salt well. Leave in a colander for 20 minutes then rinse and dry well. Stir through the chilli paste, add the water and vinegar to taste. 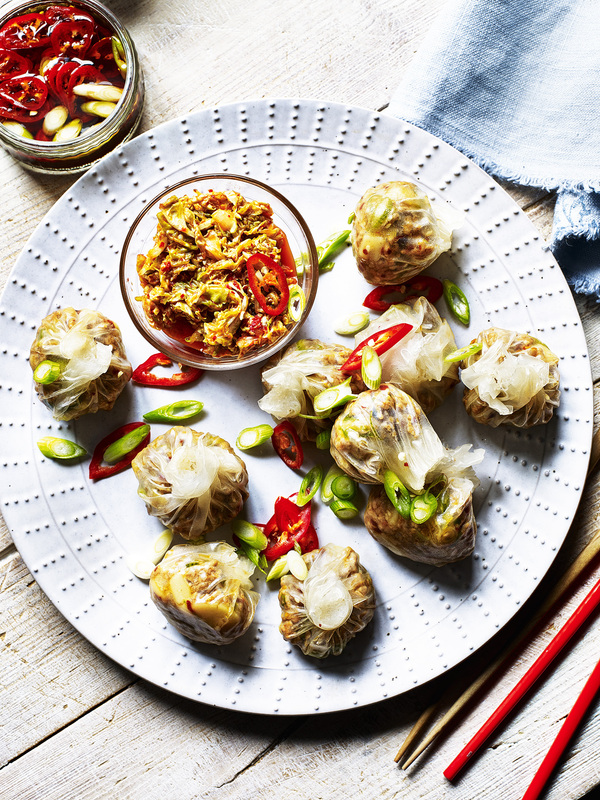 Steam the dumplings in the microwave for 3 minutes and serve with sesame oil and soy sauce to dip and a scattering of sesame seeds, sliced red chillies and spring onions.